This short book contains nearly all the slides from the training course we give to teachers in schools/colleges. There is also additional material which cannot fit into the session. Scroll down for reviews. a Kindle ebook (which can be read on any computer, tablet, phone etc with the free Kindle Reader). Buy this version from Amazon. paper copies direct from us using the link below. 5.0 out of 5 stars: If you’re looking to improve teaching or look at it from a different perspective, this is the book. During my teaching qualification, it was said ‘cut to the chase, give us something that works!’ Well here it is, classroom teaching that works from nursery through to adulthood, the points made are relevant and based around new technology not some theory that can be proved or disproved. Together with his other book, how the brain works, I now have ‘tools’ for the classroom. Don’t get me wrong, there is more reading to do, but this is relatively short and easy reading material from which to expand. Knowing how the brain works is such an interesting topic on its own, but with how to apply this in a classroom really is a life changer. It is fairly cheap and along with his other book, I know I will change my approach to classroom teaching and learning in the future. 5.0 out of 5 stars: Excellent, practical, sound. “Classroom teaching that works” is excellent because it is based on proper evidence, unlike all the streams of ineffective initiatives that pour through schools endlessly. This makes the book worth reading. Then it’s full of practical ideas which make a difference to your teaching, presented in a straightforward way. This makes the book easy to read, too. I recommend it to anyone who wants to teach more effectively and know that it’s actually going to work. 5.0 out of 5 stars: It tells you what ‘evidence-based’ means. This book is very readable and is based on the workshops Mike does on this subject which I have attended and have very good reviews. It tells you what ‘evidence-based’ means in teaching, where to find the evidence and then, how to use it to improve what the students learn. I found the illustrations really help me understand the material and the anecdotes brought it alive. Would recommend to anyone working in education. I was very impressed by Classroom Teaching That Works. It is easy to read and the explanations of how to do things very clear. The ideas are based on proper research and the book makes an excellent synthesis of research by Hattie and others. As the Head Teacher of a Teaching School I was sufficiently impressed to buy a site licence. 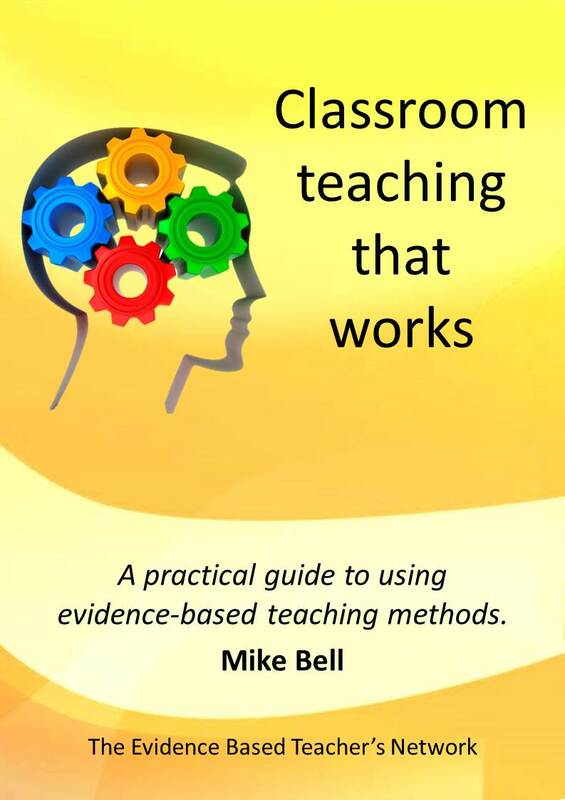 The book brings together key ideas from evidence based teaching, as the name suggests. Not 5 stars as it seems rushed in places, the odd word missing in a sentence or the wrong version of a word used e.g. Teaching rather than teacher (example not actual error spotted). Otherwise great product.